on November 7, 2017, 9 a.m.
Millennials in Singapore feel they are represented better by the media than by advertising, according to new YouGov Omnibus research. The online survey comparing the opinions of respondents born between the mid-1940s and mid-1960s (baby boomers) and between the early 1980s and mid-1990s (millennials), asked how well represented they feel by the way they see people look, act and have similar views to them in the media and advertising. When it comes to the media, 60% of millennials say they feel well represented, against 30% who feel that they are either not very well represented or not represented at all. The net score for millennials (those who feel well represented minus those who do not) is30; considerably higher than that of baby boomers (-29). 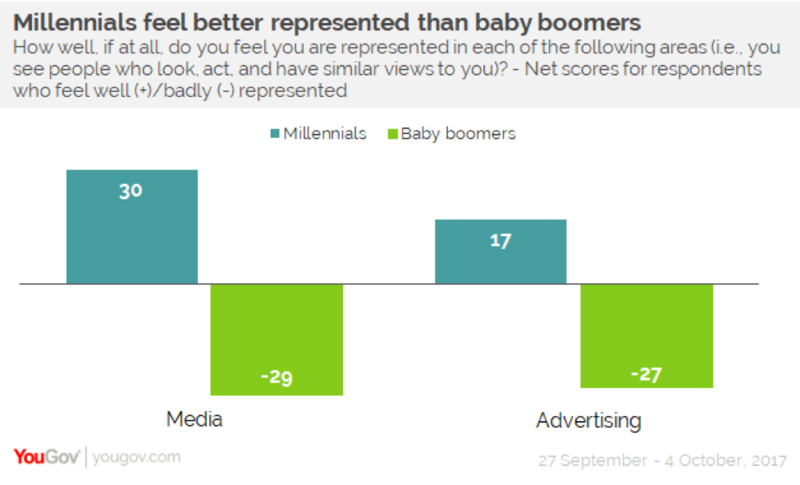 By contrast, just 30% of baby boomers feel well represented and as many as 56% feel poorly represented, meaning there are more baby boomers who feel poorly represented in advertising than those who feel well represented. Millennials feel far less well represented by advertising than the media. The net score for millennials is 13 points lower for advertising than it is for the media. Baby boomers’ score is -27, suggesting that this age group feels poorly represented. Baby boomers feel the biggest reason for feeling poorly represented is on account of their age (cited by 6 in 10 respondents), whereas millennials who feel poorly represented say that their occupation is the biggest factor (cited by three in 10). Millennials’ love of the digital world is well-documented, with selfies and social media playing a prominent role in many young people’s lives. Indeed, 8 in 10 millennials read or watch content from social media at least once a day. Less attention is paid to the time baby boomers spend on social media. 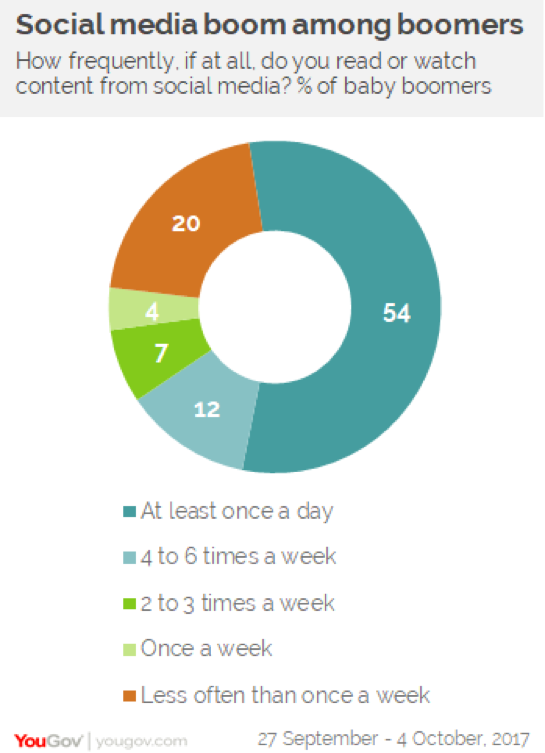 The YouGov Omnibus survey also found that as many as 54% of baby boomers either read or watch content from social media at least once a day. Social media also appears to shape consumer spending far more for millennials than for baby boomers. While 1 in 8 of millennials make purchases at least once a week based on things they’ve seen on social media, just 1 in 20 boomers do. Data was collected online by YouGov Omnibus between 27 September and 4 October 2017 among 1,061 respondents in Singapore. Results are representative of the adult online population.